CGS Inc. is proud to offer the AGRU HST 300 Print+ 2.0 Electrofusion Machine by HÜRNER. This electrofusion machine is compact and portable with a metal carrying case standard. Each HST 300 comes with an installed carry handle and an extra set of tips to allow for fusion of all manufactured fittings. Data input is made simple with a full number pad as well as a barcode scanner. The HST 300 can store up to 10,000 welding reports containing welder ID code, date and time, GPS coordinates, 16-digit fitting ID number, welding time and voltage, and much more. Data output is straightforward with a USB interface or Bluetooth connectivity to allow a PDF of all welds completed with your machine. 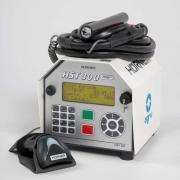 For more information on the AGRU HST 300 email info@cgs-inc.com or visit the following link: http://www.cgs-inc.com/agru.